At PAX East, Crystal Dynamics is celebrating the 20th anniversary of the Tomb Raider Franchise. The first Tomb Raider game came out in October 1996, so not 20 years exactly yet but this year in general is a good year to celebrate. Now I'm sure if you've read some of my blogs in the past you would know that I am a huge Tomb Raider fan. My dad played the Tomb Raider games while my sister and I read Stella's walkthroughs when I was very young. Ever since I've always love the Tomb Raider series and it's always held a special place in my heart. I watched my dad play through all of the original Tomb Raider games and maybe about a year or two ago I started playing them. I beat Tomb Raider 1 fairly quickly about 2 years ago. When I got to Tomb Raider 2, my save got deleted so I stopped for awhile and started playing Tomb Raider 3. I've played Tomb Raider: The Last Revelation when I was younger, and my dad never bought Tomb Raider Chronicles so neither him or I have played it. I recently bought it and will be playing it once my Paragon and Uncharted 4 Phase is done. When the newer games came out on the PS2 my dad couldn't play them. He's never been a fan of the analog stick so he had me and my sister play Tomb Raider: Angel of Darkness. We beat it after a lot of redoing to make sure we got all of the treasure just like my dad would. From then on I played and beat Tomb Raider: Legend, Anniversary, and Underworld. Right before I came to UAT I was so happy that they rebooted the series and after I beat Tomb Raider (2013) it made me even more excited to come to school to work on games. Just in this past year, I got The Rise of Tomb Raider and loved it. I loved all of the changes and new things they did with it. Now I may have all of the Tomb Raider games and some memorabilia now but I know it's nothing compared to some people. I've seen some of the biggest collectors of the series. 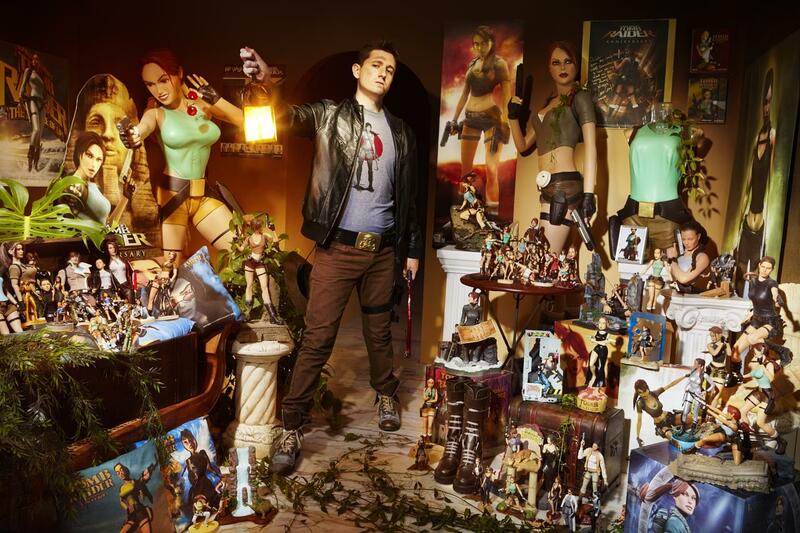 You can see some pictures below of Rodrigo Martin who earned a Guinness World record for more than 2,000 pieces of Tomb Raider memorabilia in 2015. In 1998 Crystal Dynamics released Tomb Raider 3. During the release party they showed a video called Tomb Raider: The Trilogy. Watch the short video below to see what it's about. This made me laugh a bit.